The daily calibration of your dose calibrator is recommended to ensure accurate and reproducible instrument response. Calibration, using long-lived standards, should be performed in a manner that most closely represents how you use your dose calibrator. The Syringe Dose Calibrator Source was designed for imaging facilities that obtain their radiopharmaceuticals in unit dose syringes. The sources are solid cast epoxy, 3 ml active volume in a 5 cc "mock" syringe. They are calibrated within ± 5% accuracy at 99% confidence level, NIST traceable. Each source includes a certificate of calibration, leak test certificate, and radiation safety and handling sheet. The source is packaged in an individual lead shield that is color coded to the source. 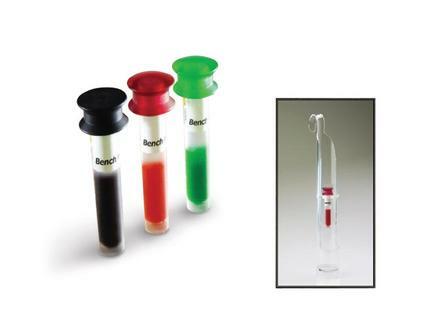 Syringe Dose Calibrator Sources are available individually or as an economical set. All sources calibrated to ±5%.